This dish is my little way of protesting an opinion piece that appeared in the New York Times recently suggesting that eating free-range pork poses a significant health risk compared to swine raised in factory farms — and as an aside mentioned how foolish it is to eat pork that is cooked below the incineration point. Without getting into the politics of it too much (I weigh in on the discussion here, and there is a good back-and-forth here, starting with the author’s rejoinder — NOTE: I am not the “hank” in the comments of the Atlantic piece. ), suffice to say I do not subscribe to the author’s belief. I like my pork done medium. And in this case, I like my wild boar tenderloin medium. Let me first say that the risk of picking up trichinosis by eating wild boar (and especially bear) is real — far more real than that in free-range hogs. Let me say next that this real risk is still very, very small: If you ate fresh, rare boar, it’s still less than one in a hundred, according to most research I’ve read. Bear, by the way, is higher. I don’t eat bear (for lots of reasons). Now let me say that one-in-a-hundred is still too risky for me, as the symptoms of trichinosis are no fun. So how can I eat pink pork? Easy. Most of my wild boar is frozen hard in a box freezer that gets close to zero degrees Fahrenheit; this will kill the parasites. Second, pink pork is still cooked hotter than the little wormy things can bear. If you are like me and like medium pork, shoot for a temperature of at least 140 degrees, and better yet 145-150. (Trichinae worms die at 137 degrees). Let me finish by saying that I have never seen any evidence of parasites in any meat Holly or I have brought home, although I did find worms in a few jacksmelt I caught at Bodega Bay last year. On to this dish, which to me stamps the season perfectly right now: Asparagus and green garlic are in full swing, so we are gorging ourselves on it while we wait for sugar peas and fresh fava beans. As for the boar, it seems to me like a lighter meat to transition from Red Meat Winter into White Meat (and Fish) Summer. The boar tenderloin is salted, seared simply in sweet butter and then rested and sliced. 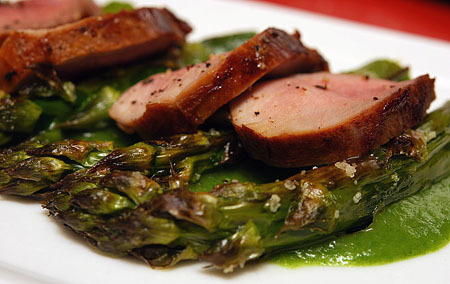 The asparagus is coated in olive oil, salted and broiled until it just starts caramelizing. where you blanch a vegetable, puree it, push it through a fine-mesh sieve or tamis, and cook it gently with a little butter or salt. Chef Thomas Keller does this with parsley. I do it with lots of things. And yes, it is time-consuming. But very worth it. The resulting sauce has enormous body, a gentle garlic-onion flavor and a richness that can only come from sweet butter. 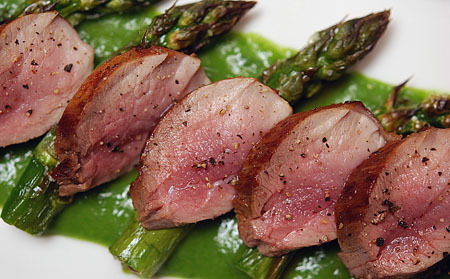 This recipe combines springtime veggies and a perfect meat for spring — wild boar tenderloin. The only hard part is making the sauce, and that isn’t so much difficult as it is time-consuming. And the sauce can be made up to a day ahead. After that, this dish comes together very quickly. This recipe would also be good with pheasant breast, lamb, venison, or even sturgeon. A word on the medium-cooked pork. This boar had been frozen for some time, which will kill any trichinae parasites should they be present (this is a remote possibility, but better safe than sorry). Should you have fresh pork, be sure to cook it to at least 140 degrees, which will kill the parasite; I cook mine to about 145-150 degrees, which is a blush of pink. Make the sauce. Get a large pot of water to a boil, and salt it well. it should taste like the sea. Blanch the green garlics and onions, white part down — hold them by the greens in the boiling water for 3-4 minutes. I suppose you could chop them in half and then blanch the two parts separately, but I have not tried this. After the white ends have been in for 3-4 minutes, toss the rest in and let it all boil for 2 minutes. Remove and dump into a large bowl of ice water to cool. Take the veggies out and chop roughly. Put the green onions and green garlics into a food processor and buss the hell out of them, scraping down the sides from time to time. It will take a bit of doing to incorporate, but you will eventually get a bright green puree. Now the hard part. Push the puree through a tamis or fine-meshed sieve. This will take some effort. Take your time and keep at it for about 10 minutes or so, or until there are only fibers in the mesh. Save the strained puree for now. Salt the pork pieces well and set aside. Turn on the broiler. Using the tablespoon of olive oil, coat the asparagus well and then salt them. Put one tablespoon of butter in a saute pan set on high heat. When the butter melts, turn the heat down to medium-high. Pour the green onion/garlic puree into a small pot and add the other tablespoon of butter, set of medium-low heat and swirl to combine. Do not let this boil. Add salt to taste. Let the boar rest while the sauce heats up. The second the sauce begins to bubble, turn off the heat and lay down some sauce on the plate. Top with the asparagus, and then with the tenderloin cut thinly. And what you’re suggesting, Chef Apprentice, is an Italian salsa verde — great with grilled meat. This time I wanted something more…refined…Can I help it if I want to git all fancy Frenchy pants every once and again? Just got my hands on a couple of back straps and I really want to try this recipe. I have a question though: I can’t find green garlic stalks anywhere. Can I substitute them with something else or maybe use some garlic cloves instead? Kristine: Maybe garlic chives? Failing that, yes, just use regular garlic.